Take a break from the ordinary to explore some extraordinary places that we invite you to call home. Real estate in Bozeman, Livingston, Ennis, and Big Sky, Montana offer access to the best of living in the Rocky Mountain West. Anyone can sell you a home in Montana, we invite you to meet a real estate company that understands the uniqueness of southwestern Montana. 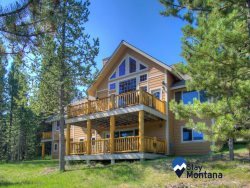 A company that connects you with experienced Montana realtors who listen and appreciate your desire to compare ski homes on the slopes of Big Sky with a fly fishing retreat on the banks of the Yellowstone River. Magnificent scenery, year-round recreation and a strong sense of history and community combine to make Bozeman a top place to live. Home of Montana State University, Bridger Bowl Ski Area and Museum of the Rockies, Bozeman provides residents and tourists with a multitude of educational, recreational and cultural pursuits. Let us be your guide through the neighborhoods of Bozeman to find homes for sale, condominiums or Montana land and acreage that fits you best. Bozeman living includes historic downtown residences, golf course properties, equine estates, secluded second homes, vacation retreats, and river real estate. Start searching Bozeman Montana Real Estate today! If your Montana real estate dream involves mountain living, where you can experience wildlife in your own backyard, skiing, biking, hiking, fly fishing or golfing right out your front door, look no further than Big Sky. Awe-inspiring, wide-open scenery is the backdrop for your resort real estate dreams. Tell us what you seek in your Big Sky property and we will assist you to find your ideal home or vacation spot. Big Sky living varies from the private resorts of the Yellowstone Club and the Club at Spanish Peaks to ski condominiums and estates at Big Sky Resort or Moonlight Basin. Start searching Big Sky Montana Real Estate today! Do you dream of azure skies with miles of views to the distant peaks; crystal clear waters with abundant trout to challenge your angling skills; down-home communities where the people greet you with a ready smile? Discover real estate opportunities in Livingston, search available properties today! Previously cattle country with over 70 ranches, today’s Madison Valley thrives on recreation, tourism, and construction. With no heavy industry, air and waters are natural and pure; perfect for telecommuters, retirees, and seasonal residents. In a place where handshakes still have value and the concept of being a good neighbor thrives. Ennis’ real estate bubble has not burst as is typical of many other areas of the country, and buyers can expect a sound market and strong resale values. Search Ennis real estate today! For more information on the southwest Montana real estate market or if you are thinking about buying or selling a property, complete the Inquiry Form below.